I am so frustrated with my blackthorn bushes. I bought them from one of those “Send a tree as a gift” places as a gift for someone that couldn’t make the Christmas party that I intended to hand them over at. So into the beds they went (and into some mulled apple juice went the accompanying sloe gin). But they’re absolutely awful. 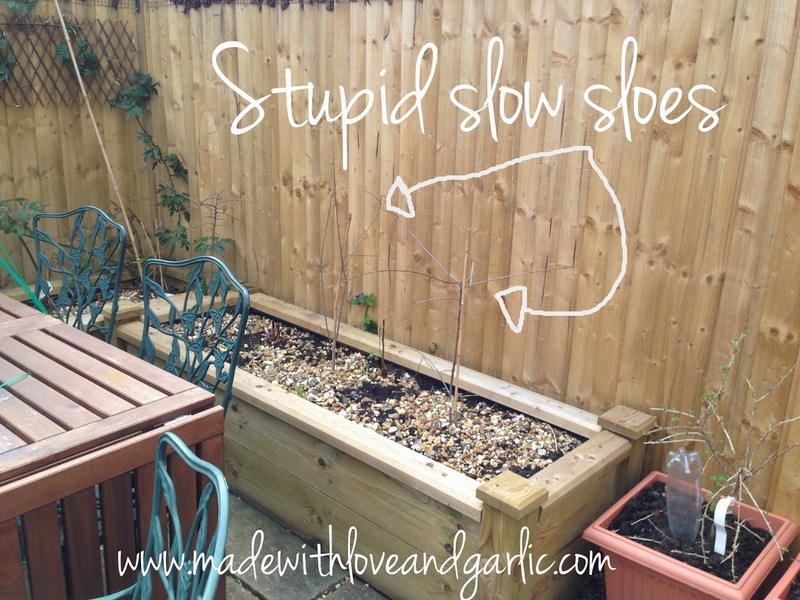 They’re growing at a snail’s pace and occupying an entire raised bed as they do so. Last year I got cross and stuck in the peony that I bought at the Chelsea Flower Show sell-off. And this year I think I’m going to make the bed useful. It was supposed to provide me with lots of lovely fat sloes so that I could make South West London Sloe Gin but so far they still look like rubbish twigs in the raised beds. So I’m going to plant something in with them. I haven’t decided whether it’ll be kale or broccoli yet but it’ll probably be one or the other. Stupid slow sloes.